Gothic Max Standard High Tunnels, with 4'H sidewalls, sufficiently modify the environment to enhance crop growth, quality and yield. 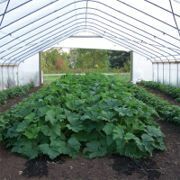 Ideal for a wide variety of crops, these high tunnels offer temperature control and protection from wind, rain, disease and predators. New taller high tunnels offer more growing space and increased ventilation! Gothic Max Tall High Tunnels, with 6'H sidewalls, sufficiently modify the environment to enhance crop growth, quality and yield. 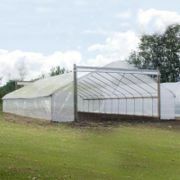 Ideal for a wide variety of crops, these high tunnels offer temperature control and protection from wind, rain, disease and predators. New taller high tunnels offer more growing space and increased ventilation!